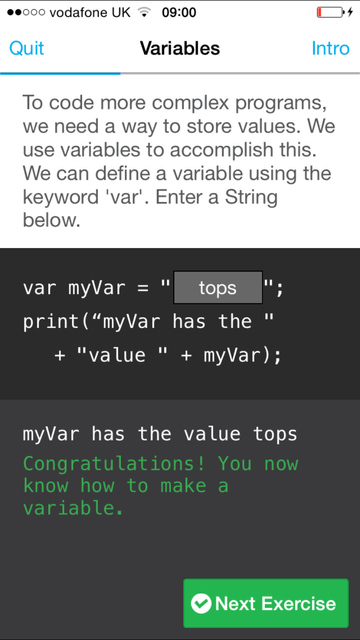 Had a quick test of the iphone app from Code Academy. Its strong on proper code, using simple code samples, and with simple gamification techniques, pretty good fun. It steps through each of the basic concepts (variables, if... else and such like) before pushing on quickly to "make your own website". I liked this piece less as you couldn't see the live html (or at least I couldn't as I couldn't upload an image). Anyway, a very nice App that will improve over time. I like their approach - see below. We are building the education the world needs - the first truly net native education. We take more cues from Facebook and Zynga in creating an engaging educational experience than we do from the classroom. Education is broken. Come help us build the education the world deserves.